MigratoryData is the industry’s most scalable real-time messaging solution, typically used in large deployments with millions of users. Among its many features, MigratoryData provides a number of monitoring options along the HTTP and JMX standards. Also, any of its API libraries can be used to subscribe to special monitoring subjects and receive real-time statistics. These MigratoryData statistics, made available along HTTP, JMX, and PUSH monitoring, are also logged on disk (at configurable time intervals) besides other log types such as access logs and message logs. While these logs are typically preserved for audit, they can also be used for other purposes such as monitoring or even debugging. For example, message logs can be used by MigratoryData Replayer – a tool able to replay a feed of messages, and publish recorded messages at slower, faster or original speeds by preserving the timestamp proportions. It becomes obvious, then, how statistics logs, access logs, and message logs produced by such a high number of users can result in a huge amount of data. Hence, using a big data platform is natural. 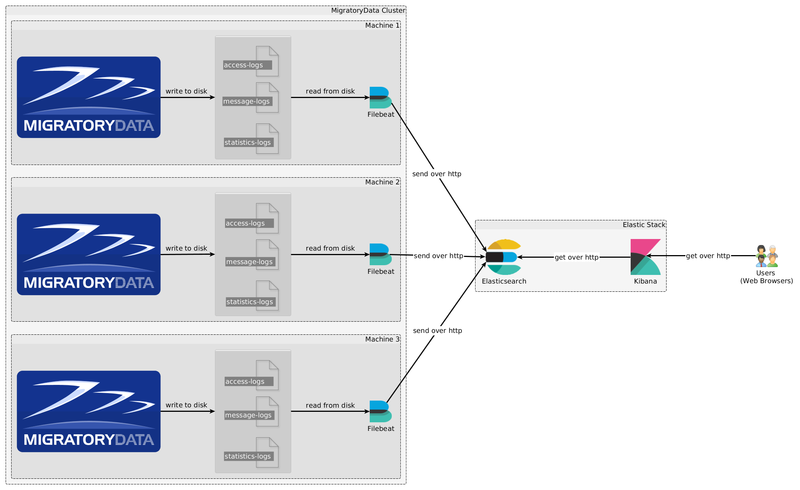 This blog post is based on Elastic Stack version 5.3.0 and MigratoryData version 5.0.21. 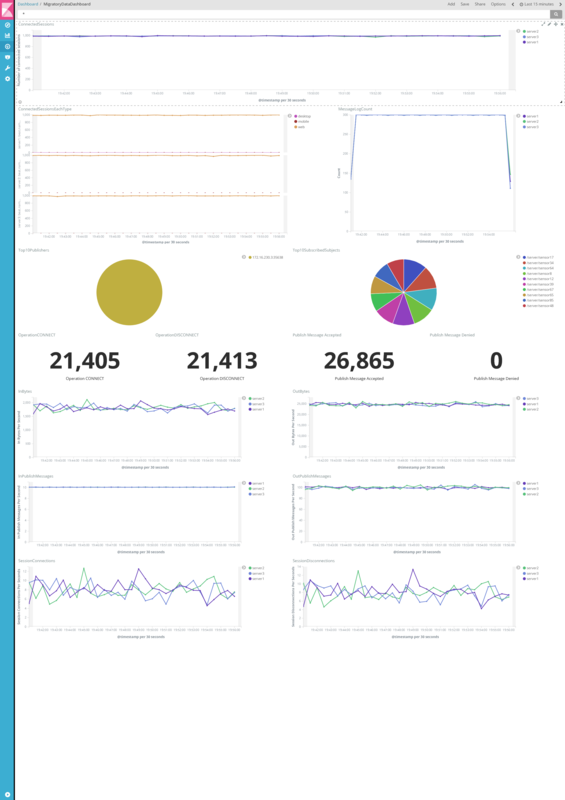 All configuration files, dashboards, diagrams, and screenshots can be found on github. For the purposes of this post, our setup consists of a MigratoryData cluster of three nodes. Each node runs one instance of MigratoryData Server and one instance of Filebeat. Filebeat is an agent which collects access logs, message logs, and statistics logs produced by the MigratoryData server. These logs are collected as soon as they are produced by the MigratoryData server. 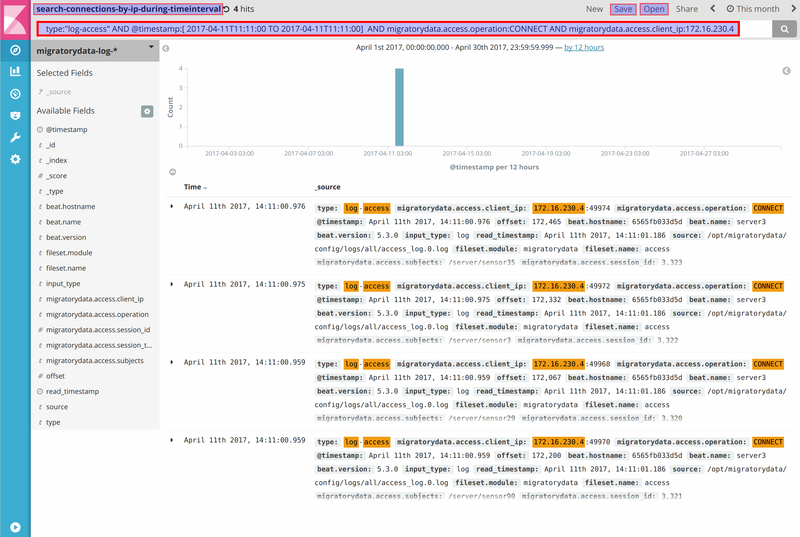 Collected logs are then sent to Elasticsearch over the network. Finally, users connect from web browsers to Kibana to make queries which are automatically forwarded to Elasticsearch. You can start by installing one instance of Elasticsearch and one instance of Kibana on the same machine. Advanced Elastic Stack settings are available, including high availability clustering, but these are beyond the scope of this post. Finally, run the startup script elasticsearch located under the folder bin. Elasticsearch will use the IP address192.168.1.1 configured above and the default port 9200 to accept connections and communicate with both the Filebeat agents and Kibana. Finally, run the startup script kibana located under the folder bin. Kibana will use the above configuration to connect to Elasticsearch and will use the default port 5601 to accept connections from users. One instance of the Filebeat agent should be installed on each machine of the MigratoryData cluster. 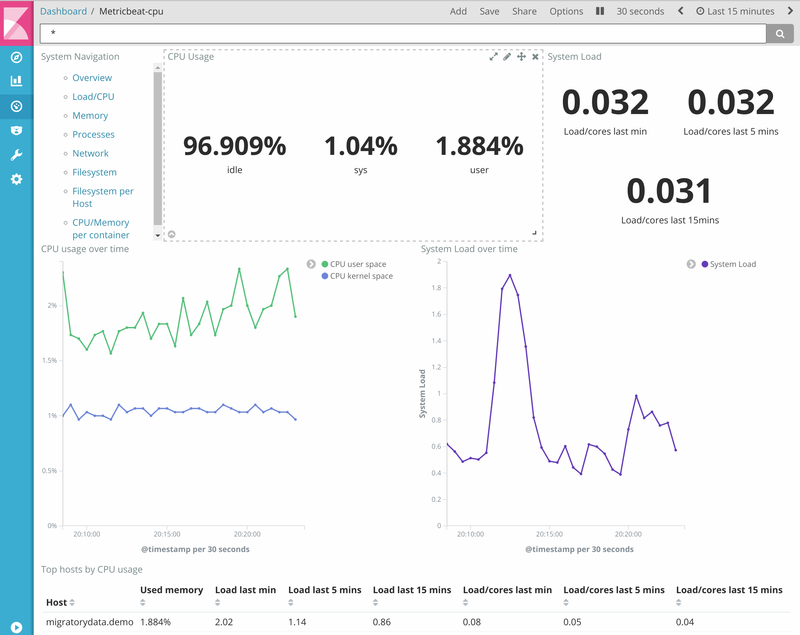 The Filebeat agent collects the logs produced by the MigratoryData server into the folder defined by its parameter LogFolder, and send them to Elasticsearch. In order to install Filebeat, download the package in zip or tar format and uncompress it. Filebeat comes with a number of predefined modules available under the folder module. For example, there is a module for collecting logs of apache2 or nginx. A module basically defines the rules for transforming a particular logging format into a field-based format understood by Elasticsearch. The module based architecture of Filebeat allows us to create new modules. We created a new module for Filebeat named migratorydata which defines the rules for parsing the access logs, message logs, and statistics logs of the MigratoryData server. In order to install the new module, copy the folder migratorydata available in the github repository under the folder elastic-stack/filebeat/module into the folder module of your Filebeat installation. The module is structured into three similar sections corresponding to the three log types: access logs, message logs, and statistics. For the message and stats sections, document-type is message-log and stats-logs, respectively. Similarly, the manifest of the message and stats sections will be similar excepting the paths pattern which ismessage_* and pushserver_*, respectively. Finally, the pipeline file defines the parsing rules of the logs. These rules are specific for each log type. This file is also available under the github repository. This file specifies the address of Elasticsearch as well as the name of the Elasticsearch index used to group all the documents corresponding to the MigratoryData logs received from the Filebeat agents. Please note that the -E name=server1 part of the above command is optional. If not provided, Filebeat will use the hostname of the machine running that instance of the MigratoryData server. Using such assignation is particularly useful for testing when all servers of the MigratoryData cluster run on the same machine. Indeed, in order to be able to monitor each instance of the MigratoryData server of the cluster individually, each Filebeat agent will add a built-in field beat.name containing the value provided by the name attribute above to each log that it sends to Elasticsearch. 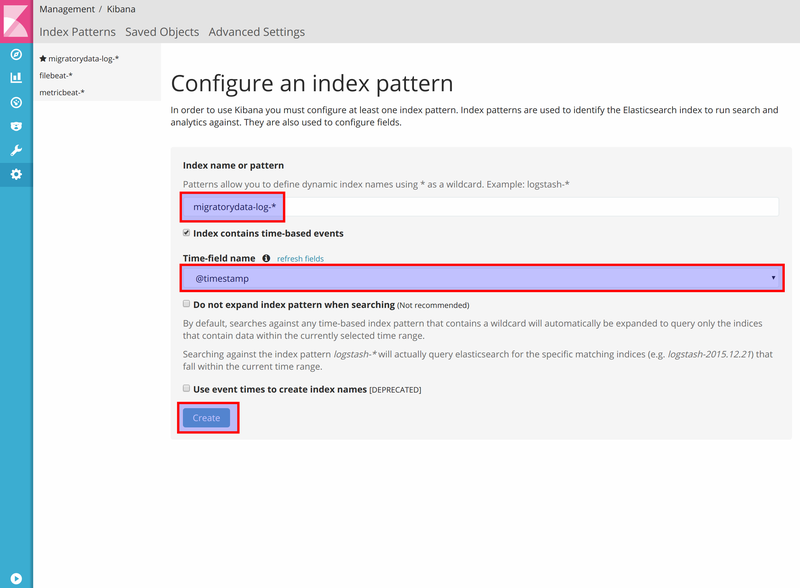 Once the index has been created, you can see it by navigating to Management -> Index Patterns. To explore all data received from the MigratoryData cluster, navigate to Discover, type * in the query box, and select the migratorydata index pattern migratorydata-log-*. In the top menu on the right, you have a time picker where you can select for example Last 15 minutes and can also define Auto-refresh to a configurable amount of time, say 10 seconds, to see the data received continuously during the moving window of last 15 minutes. You can also use the time peaker to explore any desired time interval including a given number of seconds, minutes, hours, days, or years ago. Finally, you can also explore the data between two absolute dates. The histogram in the screenshot above shows the number of MigratoryData logs indexed every 30 seconds during the selected time period. The table below the histogram lists Elasticsearch documents, structured by fields, corresponding to the MigratoryData logs which occurred during the selected time period. The left hand side displays the field names, which correspond to the fields defined by parsing rules of the Filebeat agents as explained above, together with a number of built-in fields introduced by Filebeat (above we already discussed the built-in field beat.name). You can refine your exploration of the data in the previous section by entering a search criterion in the query box. You can perform a free text search or also search data by field. For example, to get all the logs of users which connect from IP address 172.16.230.4, you can perform a a search such as migratorydata.access.client_ip:172.16.230.4. Below is a more complex search using boolean operators. Note that the boolean operators AND, OR, and NOT are case sensitive. For more details, please refer to Kibana documentation. A search filter can be saved and used for a later search. In this example the search filter has been saved under the name search-connections-by-ip-during-timeinterval as highlighted in the screenshot above. The saved search filter can be also used to build visualizations for the filtered data (as shown in the next section). It is worth mentioning that the time picker of a search form can be used, for example, to define an Auto refresh time such that new search results can be displayed as long as new data are added to Elasticsearch which match the search criterion. As an example, we visualized the outgoing bytes per second during the last 15 minutes. We filtered stats logs using the search criterion _type:log-stats, defined the Y axis based on the field migratorydata.stats.out_bytes, grouped values in buckets of 30 seconds time periods according to the X axis defined by @timestamp, and finally displayed the bucket’s average of the outgoing bytes per second for each MigratoryData server of the cluster. We also split the lines by the field beat.name discussed above, which help to distinguish among the data coming from each cluster member. In the screenshot above we defined Auto refresh at 10 seconds and therefore the chart is updating continuously every 10 seconds. Visualizations can be saved and are typically used in building dashboards as we will be showing in the next section. Multiple visualizations can be grouped together into a dashboard, and can be easily rearranged. The screenshot below provides one such example, with the the name of each visualization visible on the dashboard. 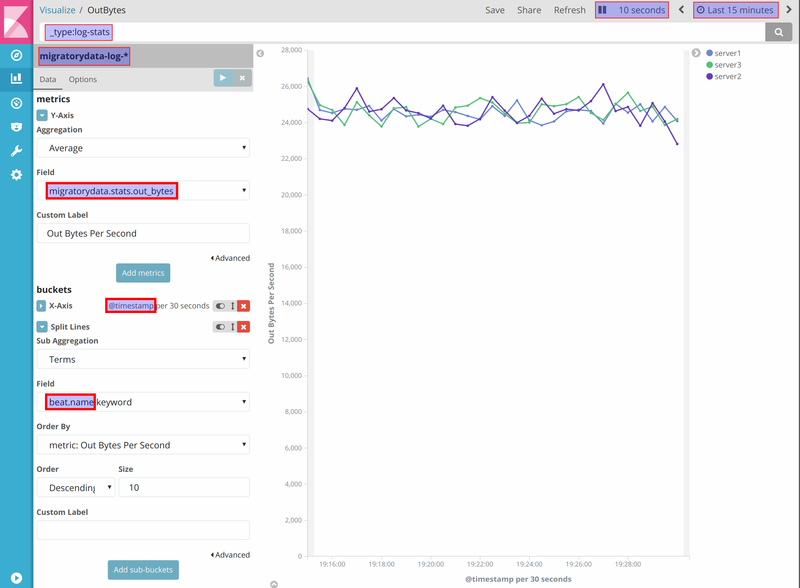 As for all other Kibana elements, an Auto refresh time can be defined, such that monitoring is performed continuously. The time picker can be used to monitor various time periods including historical time intervals. This dashboard template is also available in the github repository. In order to load it, navigate to Management -> Saved Objects -> Import. Using the few concepts presented above you can build various filtering, visualizations, and dashboards according to your needs. Moreover, you can simply build new modules to index additional information into Elasticsearch. Last but not least, Elasticsearch has integrations with various applications and therefore you can use it to monitor other environments alongside MigratoryData clusters in a single place. Besides the Filebeat agent, Elasic Stack provides Metricbeat, an off-the-shelf agent which collects various system information. This allows you to monitor each machine of the MigratoryData cluster in (near) real-time and also see historical metrics. Metricbeat comes with predefined dashboards which you can load as explained above. Metricbeat should be installed alongside Filebeat on each machine of the MigratoryData cluster. Here is an example of a dashboard produced with Metricbeat. In the future we will enhance the Filebeat module migratorydata to also parse the GC logs produced by the Java Virtual Machine (JVM) running the MigratoryData server. What are your thoughts on the above? We welcome all suggestions and would love to enhance monitoring with any additional information and dashboards, at your request. Just let us know! Finally, for more information on MigratoryData Server, and for a comprehensive list of product features please visit migratorydata.com. 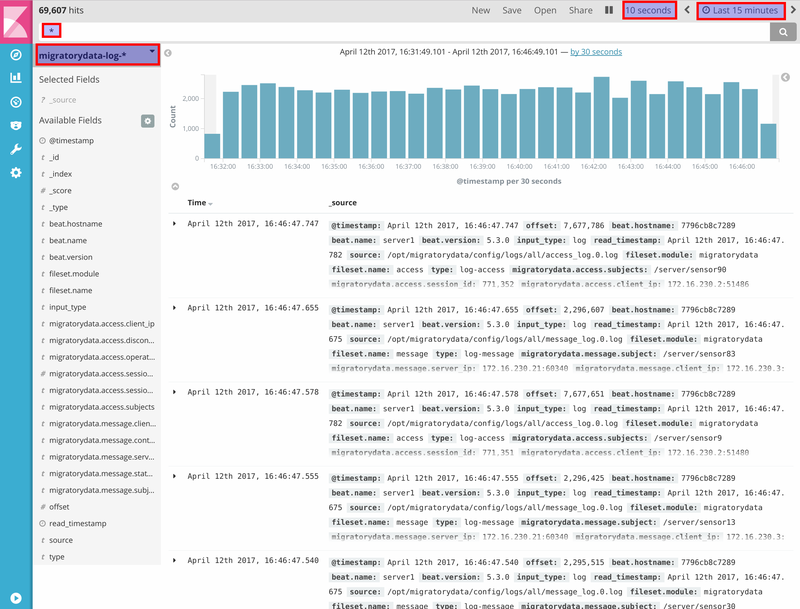 This entry was posted in Big Data, migratorydata, Monitoring and tagged Big Data, elasticsearch, kibana, migratorydata on April 14, 2017 by Mihai Rotaru.